Hidden World War I tunnels on the Stanford campus? Author Barbara Wilcox first heard about them from a geophysicist colleague when she was working at the USGS in Menlo Park. 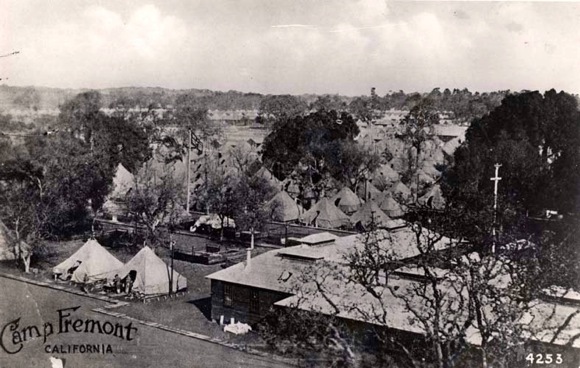 She later learned that as America entered World War I in 1917, Stanford University leased three-fourths of its Palo Alto land to allow the creation of an Army training camp, Camp Fremont, headquartered in present-day Menlo Park. The resulting thesis, which Barbara wrote for her Masters of Liberal Arts at Stanford, is now a book called World War I Army Training by San Francisco Bay: The Story of Camp Fremont, which is being published today and available on Amazon. She describes the book as being an “interpretive history of the era,” asking large questions as why was it here, why we should care, and what lasting impact did it have. One answer, according to Barbara, is the technology transfer that happened. “The engineers learned things at the Camp that they used to develop the West,” she cited as example. Another, the cartographic system that was used at the Camp was picked up by USGS to map California. Then there was the lasting infrastructure which includes the VA Hospital on Willow Rd. and the sewer system that lasted through 2000 or so. Barbara, a Menlo Park resident, will be giving a talk about her research and the book on Jan. 19, 2016, to the Stanford Historical Society at 5:00 pm. The event, which is open to the public, will take place at the Jordan Hall Auditorium (Bldg. 420, Room 40 at the basement level), 450 Serra Mall, on the Stanford campus. April 3 at Palo Alto Historical Association, 2pm, Lucie Stern Community Center. April 10, 4-7 pm, reception at MacArthur Park restaurant. April 16, “A Company of Authors,” Stanford Humanities Center, 1-5 pm. All events free and open to the public. Thank you Barbara for giving your talk at our Kiwanis Club of Los Altos last Tuesday. It is so wonderful to have this history captured for generations to come. Great to see interest in Camp Fremont. My fathers uncle trained there and was then shipped off to fight in Europe. 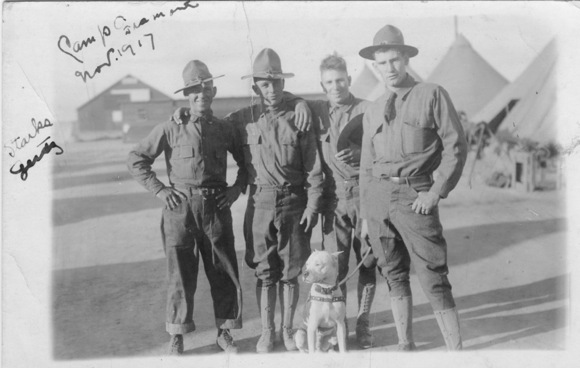 I have his photo album of Camp Fremont, and then pictures of getting on the train with other local troops to New York City, then photo’s of the battlefields capturing German troops.